Here is the Latex Template . Lecture 1 Here is the Lecture#1 Notes . Lecture 2 Here is the Lecture#2 Notes . HW 2 Here is the Homework 2 . Deadline is 20th Feb 2018. HW 3 Here is the Homework 3 . Deadline is 28th Feb 2018. Lecture 4 Here is the Lecture#4 Notes . Lecture 5 Here is the Lecture#5 Notes . Lecture 6 Here is the Lecture#6 Notes . HW 4 Here is the Homework 4 . Deadline is 7th March 2018. HW 5 Here is the Homework 5. Deadline is 14th March 2018. Lecture 7 Here is the Lecture#7 Notes. Lecture 8 Here is the Lecture#8 Notes. Lecture 10 Here is the Lecture#10 Notes. HW 6 Here is the Homework 6. Deadline is 26th March 2018. HW 7 Here is the Homework 7. Deadline is 18th April 2018. HW 8 Here is the Homework 8. Deadline is 25th April 2018. Lecture 11 Here is the Lecture#11 Notes. Lecture 12 Here is the Lecture#12 Notes. Lecture 13 Here is the Lecture#13 Notes. Lecture 18 Here is the Lecture#18 Notes. Lecture 19 Here is the Lecture#19 Notes. Lecture 20-21 Here is the Lecture#20-21 Notes. Lecture 22 Here is the Lecture#22 Notes. Students have to submit homework individually. This course is intended towards a potential research body in the theory of computer science. 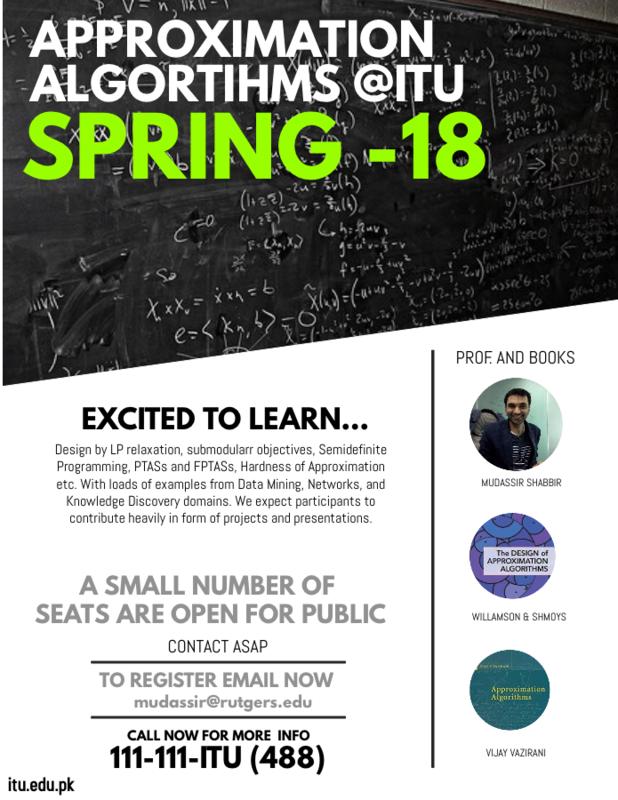 So if you are committed to pursue a PhD in CS, or are a faculty member who regularly teaches theory course at your institute, this course is an ideal window towards more they for you. This course is NOT aimed at software engineers; this course will NOT help you write more efficient or better software, and this course will certainly NOT help get you a better job. This is an advanced course in theory so you must already be versed with discrete math, graphs, algorithms, and probability theory. To register please send an email to mudassir@rutgers.edu with title: REGISTER FOR AA. Please write a paragraph about you and why you should be registered for this course. You will be called for a short interview and if we find that you can benefit from this course, we will approve your registration. Admission/Registrar office will help you with documentation afterwards. There are a total about 20 seats and a majority of those seats are reserved for ITU students. Remaining seats are on first come basis so it is suggested to have your interview scheduled at earliest. The goal of this course is to learn the tools and technique to design approximation algorithms. As Linear Programming is probably the most effective candidate, we will spend a considerable time studying examples of NP-Hard problems that can be approximately solved by LP. After that we will study the Semidefinite Programming and its applications. We will study the analysis of general greedy techniques and see it has an effect on sub modular objectives. If we get time we will do a little bit of Fixed Parameter Tractability. Program for the first 3-4 weeks of the course may look like the following list from Claire Mathieu course on the same topic. Vertex cover and Linear Programming: We introduce the course topic by a typical example of a basic problem, called Vertex Cover, for which we will design and analyze a state-of-the-art approximation algorithm using two basic techniques, called Linear Programming Relaxation and Rounding. It is a simple, elementary application of powerful techniques. Knapsack and Rounding: This module shows the power of rounding by using it todesign a near-optimal solution to another basic problem: the Knapsack problem. Set Cover and Randomized Rounding: This module introduces a simple and powerful variant of rounding, based on probability: randomized rounding. Its power is applied to another basic problem, the Set Cover problem. Multiway Cut and Randomized Rounding: This module deepens the understanding of randomized rounding by developing a sophisticated variant and applying it to another basic problem, the Multiway Cut problem. We will start our classes in early Feb and will remain engage for next 16 weeks. Each week we will meet twice on WEEKDAYS. The timing of the class is not final yet but our graduate level classes are usually scheduled in the time window of 4PM to 8:30PM. As a participant in the class, you will be required to attend the lecture and contribute towards the discussion. Moreover you will be asked to read research papers from time to time and present them in the class. You will also have to complete homeworks, and scribe lecture notes on your turn. Mudassir Shabbir has been associated with Information Technology as an Assistant Professor since he received his PhD from Rutgers University, NJ USA in 2014. He enjoys working in theoretical computer science while his main area of research is Algorithmic and Discrete Geometry. He has developed new methods for the characterization and computation of succinct representations of large data sets with applications in nonparametric statistical analysis. He also works in Approximation Algorithms, Combinatorics, and Extremal Graph Theory.